avid Bowie was arguably one of the greatest creatives of the past 50 years. By the time he died, in 2016, he produced no fewer than 36 albums and more than 100 singles. He acted in a few dozen films and exhibited his paintings widely in museums and galleries. He co-wrote a Broadway show and developed an internet platform for creative content called BowieNet. He invented the Verbasizer, a sentence randomizer app for writing lyrics. By any standard, Bowie was wildly successful, both artistically and commercially. As a cultural icon, he achieved more than mere fame. His singular life was studded with innovation, and he practically invented reinvention. Where someone else might have rested in the glam-rock Ziggy Stardust glory days, Bowie zagged with Diamond Dogs and then Young Americans. After that foray into soul, he left for Europe and experimental electronic music. Friend and collaborator Brian Eno explained Bowie’s fearless shape-shifting as a way to “duck the momentum of a successful career” and keep his work fresh and interesting, for himself as much as for his audience. No doubt that one crucial common denominator — creating for himself, an audience of one — is what made Bowie a vital, timely, authentic artist right up until his death. Never play to the gallery. Never work for other people in what you do. Always remember that the reason you initially started working was there was something inside yourself that, if you could manifest it, you felt you would understand more about yourself. I think it’s terribly dangerous for an artist to fulfill other people’s expectations. Attempting to fulfill other people’s expectations is a fool’s errand when it comes to creative work. It’s inevitable that you will fail on some level, make compromises you regret, and end up with your worst work. You may or may not find acclaim, but you’ll be pretty miserable as a creative if you don’t follow your heart. Bowie not only believed that—he embodied what it means. 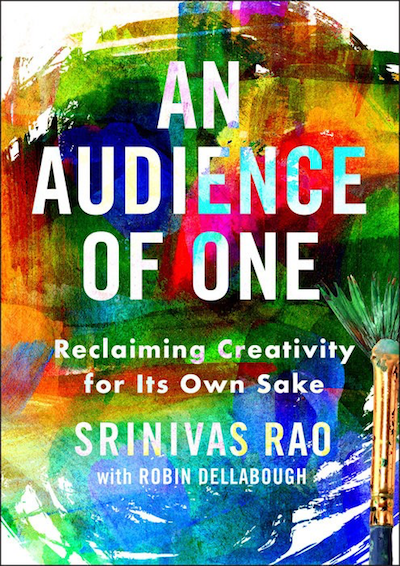 The ultimate paradox of creative work is that what you create for an audience of one is much more likely to reach an audience of millions. Many creators dream of the day when millions of people will listen to their shows, read their books, buy their products, or watch them perform. But what will you bring to the table when you’re performing only for an audience of one — yourself? We tend to undervalue creating only for ourselves and overvalue creating for a huge audience. But your audience of one will be there every day when you wake up. 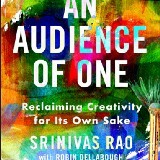 If you think that you’ll step it up only when the audience is larger, the audience, paradoxically, won’t get any larger. While the internet and technology have made unparalleled amounts of creativity possible, they have, ironically, also inhibited the creative process. One of the hardest things to do is separate your work and the effort that you put in from the results. An actor doesn’t control the movie around them. They don’t control what the other actors do. They don’t control the marketing budget. They don’t control the distribution. They could do the role of a lifetime, but the director or editor could mess it up in postproduction. If your happiness with your job and your career is dependent on how the movie does at the box office, or how the critics respond to your role, you have placed your happiness with your own life in the hands of other people, and that’s a recipe for profound disappointment. While separating your work and effort from the results is one of the hardest things to do, it’s also one of the most important. Otherwise, your sense of satisfaction, fulfillment, happiness, and overall well-being will fluctuate, depending on the “results.” If the results are largely out of our control anyway, wouldn’t we be better served by measuring our success in ways that we have some control over? Are you proud of your work? Would you happily put your signature on it? Have you met or exceeded your own expectations or previous creation? Our creativity speaks louder and more clearly when the work is separated from the results. Starting with the intention of fame and fortune drowns out the sound of our creativity and makes it more difficult for us to listen, resulting in a perpetual lack of fulfillment and an underappreciation of the joy we could experience in the process. By reframing how we define “positive” outcomes, based on what we have control over, we increase the likelihood that our creative work will be rewarding. In the pursuit of success, the value of creativity for its own sake has diminished, if not disappeared entirely. While the internet and technology have made unparalleled amounts of creativity possible, they have, ironically, also inhibited the creative process. The predominant cultural narrative that drives so much creative work is “Why create if nobody will listen, pay, or pay attention? Why are we wasting our time?” We’ve placed celebrities on pedestals and turned their achievements and lifestyles into our new definition of success. The result is a profound sense of dissatisfaction with our creativity. Purity is lost in our work when everything we do is for some external outcome, when every creative pursuit unnecessarily becomes professional. But when you examine the most successful creators, almost none of them started out to gain fame, fortune, prestige, and accolades. Toward that end, when they were paid more than $300,000 for their performance at the Coachella music festival in 2006, nearly all the money was put back into the performance, which raised the bar for what a live electronic music experience could be. It was a spectacle of light, sound, special effects, and music that eventually resulted in a YouTube video that went viral and got millions of views. Stop trying to become the next Beyoncé, Kanye, or Stephen King. Your job is to become the best version of you. Those extrinsic motivators are fine and can feel life-affirming in the moment, but they ultimately don’t make it thrilling to get up in the morning and gratifying to go to sleep at night — and, in fact, they can often distract and detract from the things that do offer those deeper rewards. To evaluate our efforts based solely on the extrinsic is the very opposite of what it means to listen to your deepest self. When we insist on the extrinsic, our work actually suffers. It is bled of authenticity and potential for an unmistakable signature, which, ironically, makes the possibility of external success less likely. Stop trying to become the next Beyoncé, Kanye, or Stephen King. The flaw in this desire is that you won’t ever become — cannot become — the next version of that person. As a creator, your job is to commit to becoming the best version of you. If you’re a better version of yourself today than you were yesterday, that’s progress. Comparison and envy stand in the way of progress in any creative endeavor — or in any life, for that matter. From An Audience of One by Srinivas Rao, to be published on August 7, 2018, by Portfolio, an imprint of Penguin Publishing Group, a division of Penguin Random House, LLC. Copyright © 2018 by Srinivas Rao.